Thank you all so much for your help with this. They're adorable rosymaplemoth, congratulations! 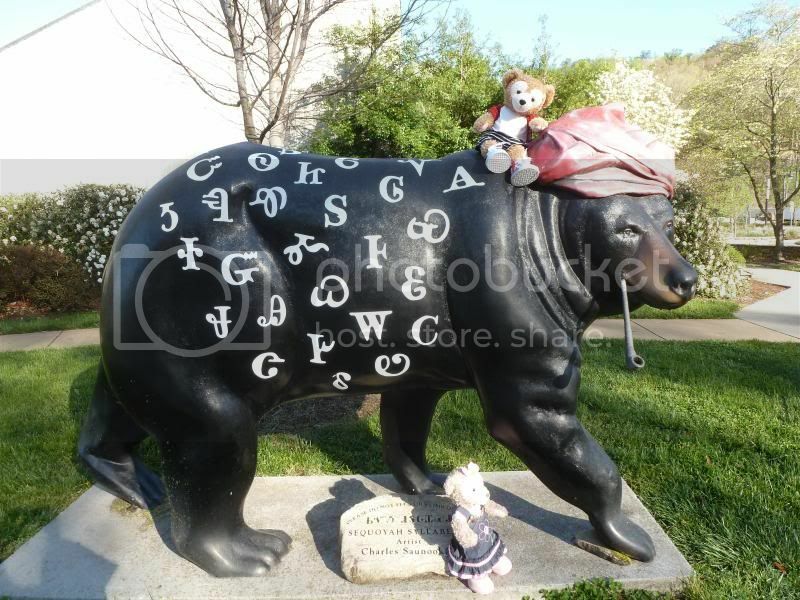 And such good looking bears as well. I wish you years of love and fun with them! And you're not the only one who's given up on a stuffed-animal free bed, in fact mine have taken over most of the house!! 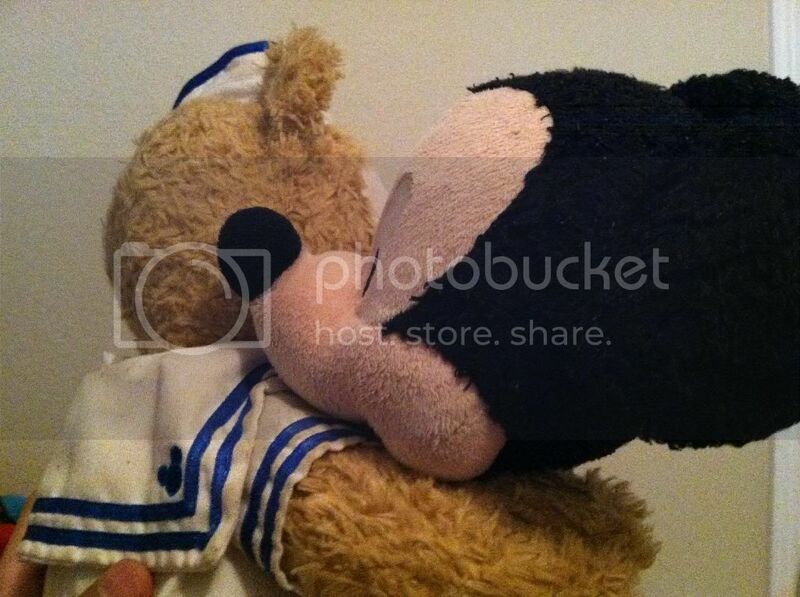 Growing up, I always preferred stuffed animals over dolls and am still like that to this day. you may not be into babies, but when you have a child, you can cultivate the obsession with stuffed animals in them! 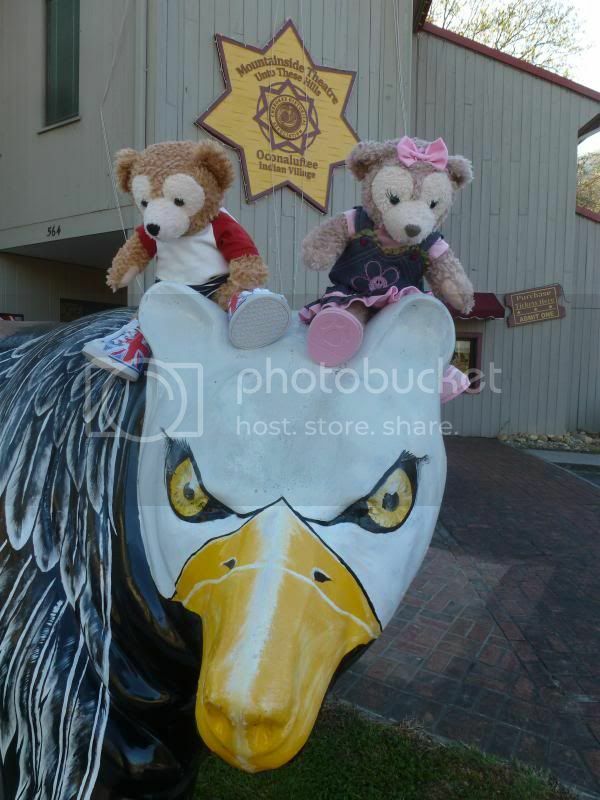 I went to Northern California to see the sights and here are the photos. Driving along the Pacific Coast Highway. Settling for the night on the road to Napa Valley. 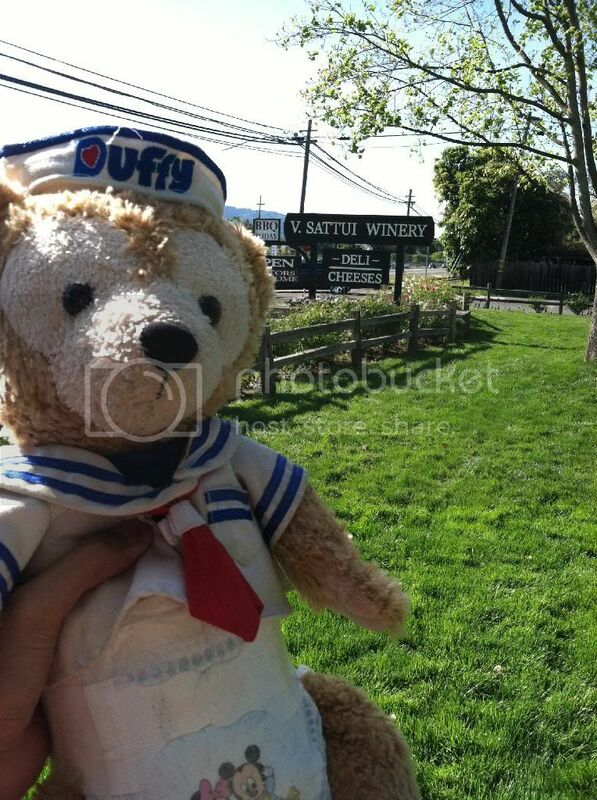 We then visited one of Napa Valley's wineries to have some lunch. 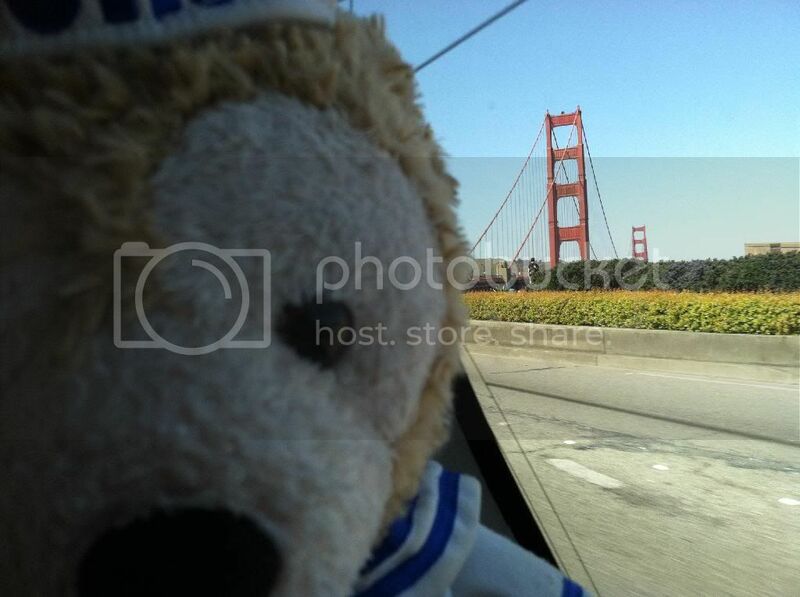 Then we drove down to San Francisco and took a few photos. 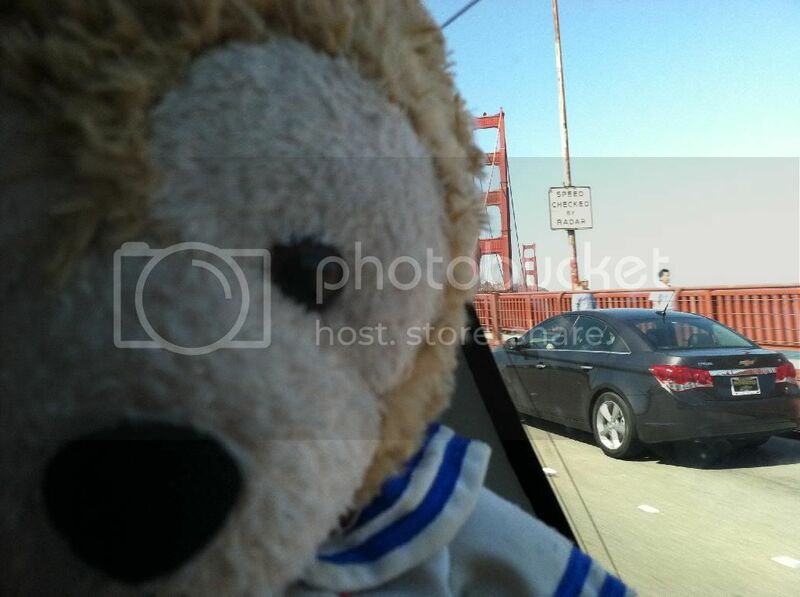 In front of the Golden Gate Bridge. 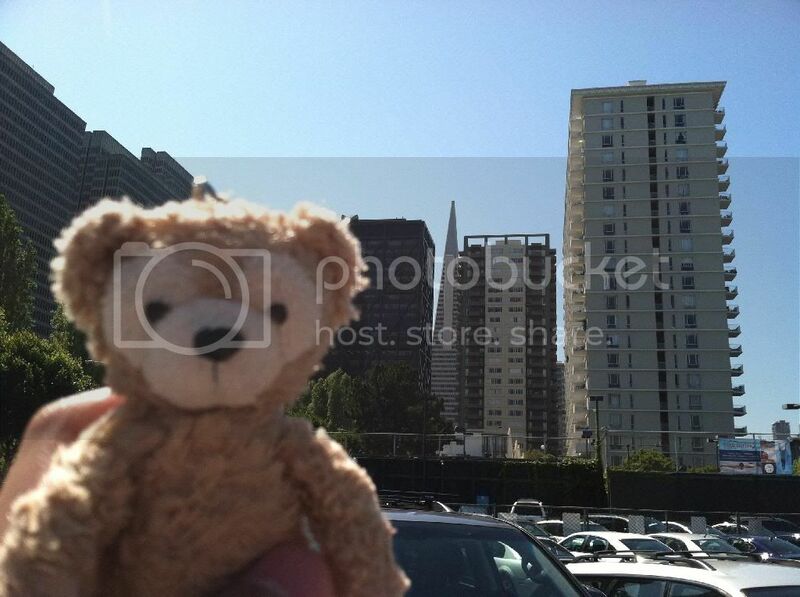 In front of the Coit Tower. 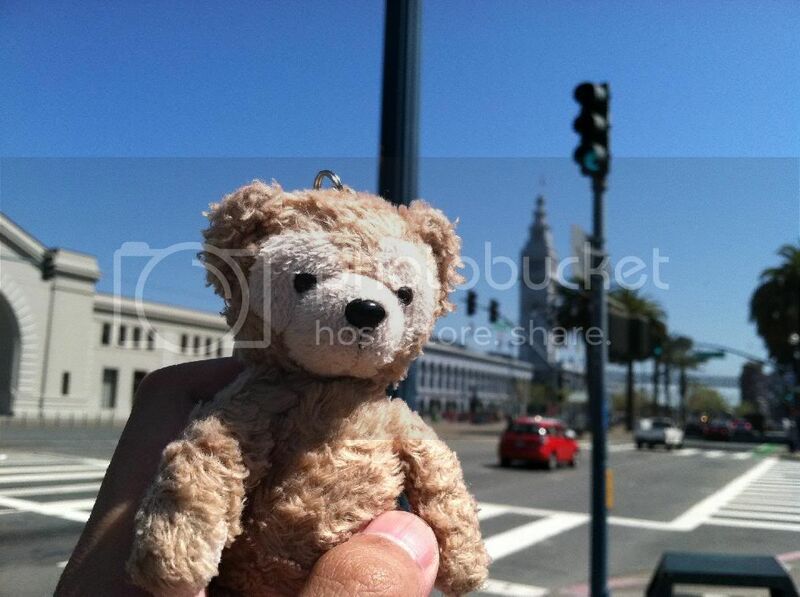 Then in front of the Transamerica Pyramid. And near San Francisco's Ports. Driving to the Golden Gate Bridge. 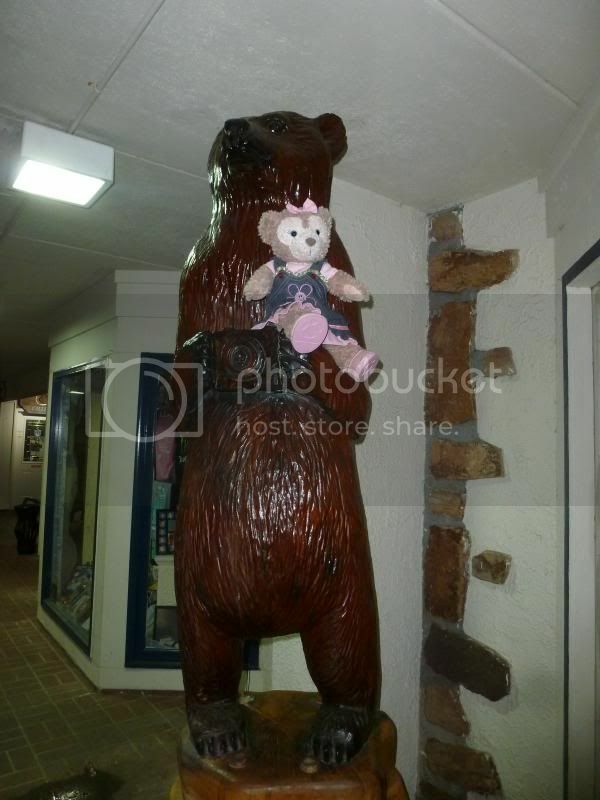 I'm so glad you got to go to Muir Woods. 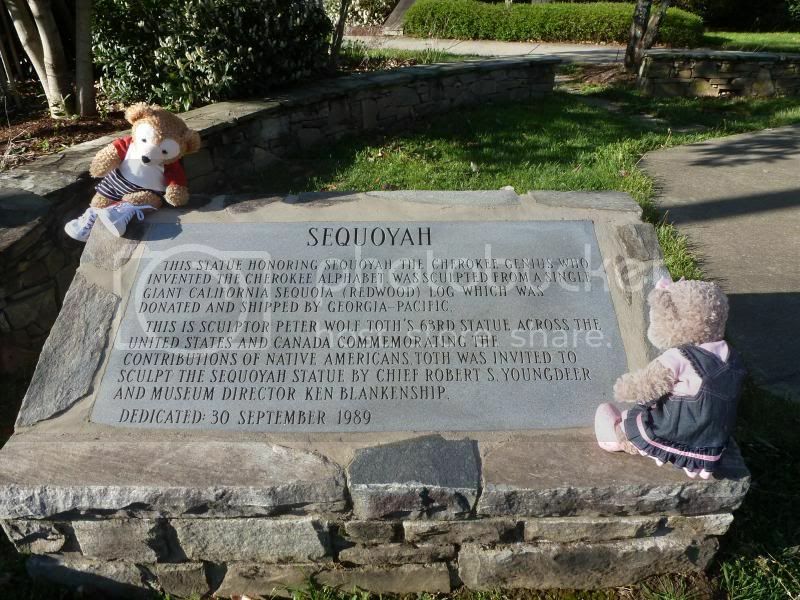 My dad lives in the area and I went there during one visit. Such a beautiful place. It looks like you had a lovely trip. 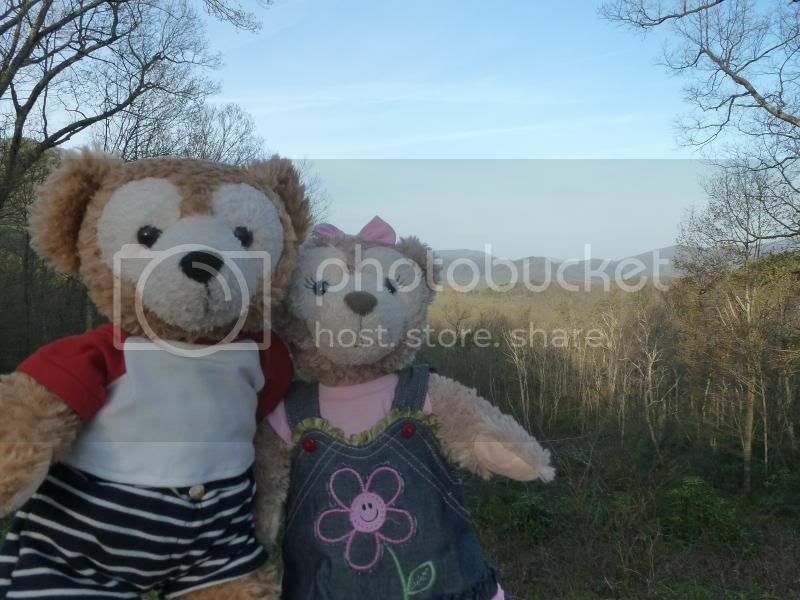 That's really interesting that Disneyland Paris has BOTH versions of Duffy out, and both are wearing the current spring costume (which is really cute, btw). I wonder why they have both costumes? I like the first one so much better, he's just more...expressive. I've just booked a trip to WDW in December. Current plan is 5th-14th. I know it is still a looonnnnggggg way off, but I'm super excited. 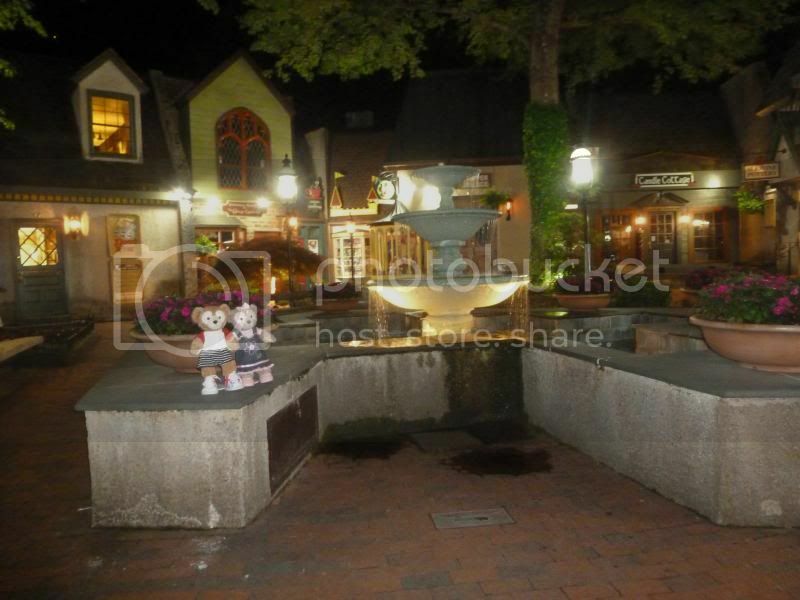 I hope to meet some of you locals or anyone else who happens to be visiting when we are. A good night to all Duffeteers. 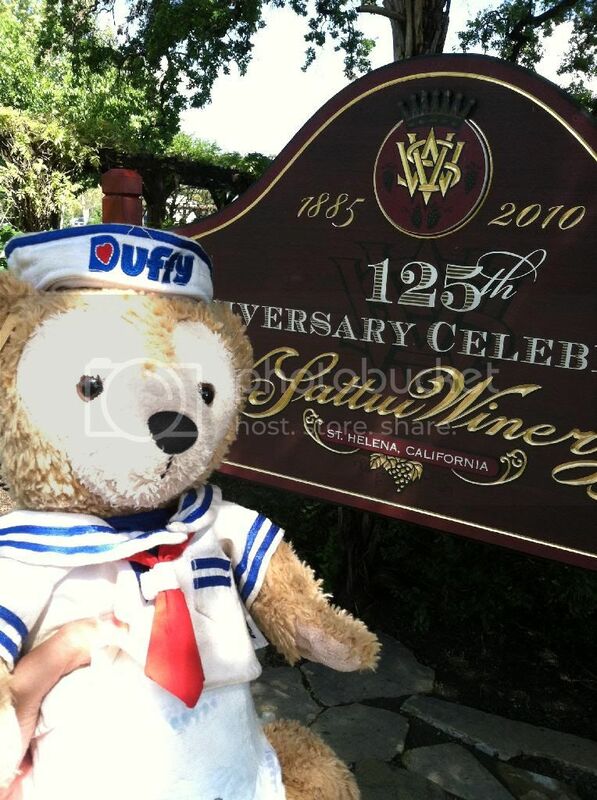 Presented at Duffy l'ours Disney, here he is in his spring outfit greeting guests and posing for photos. 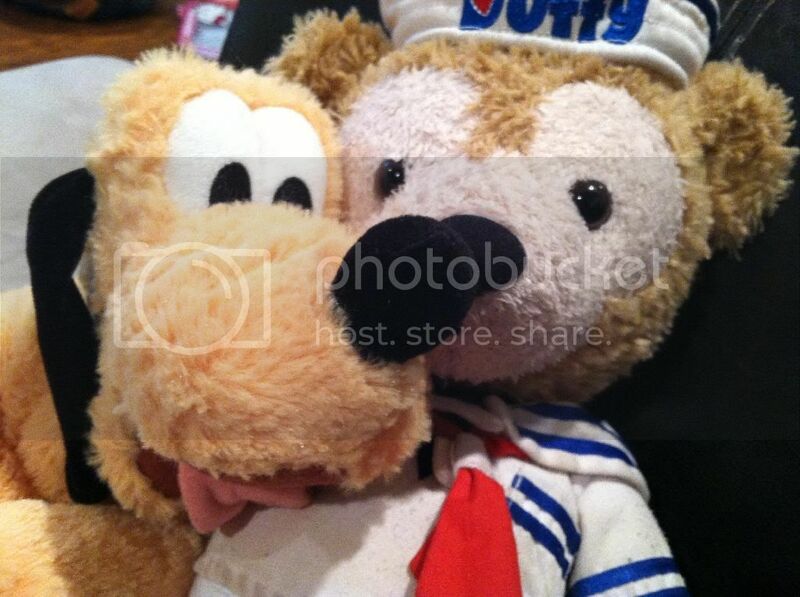 A good morning and a happy Tuesday to all Duffeteers, from Pluto and Duffy. 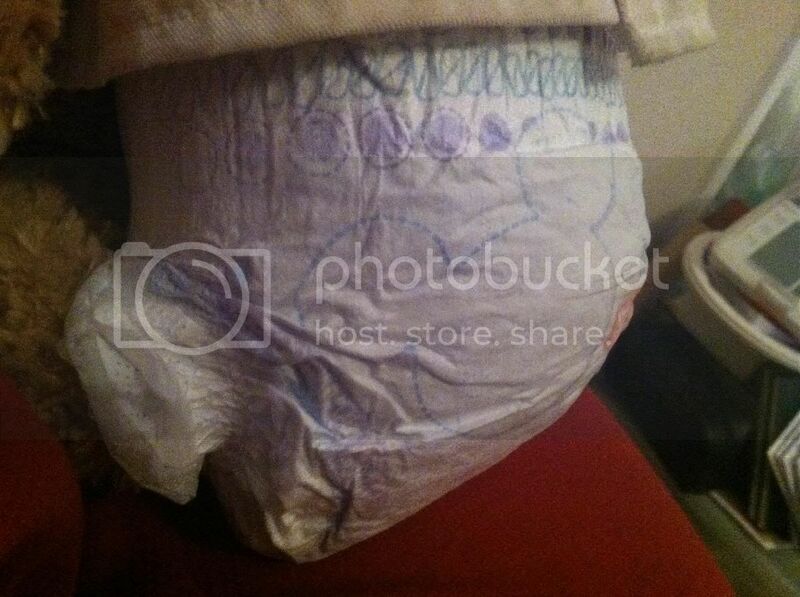 I bought Duffy some new diapers for him to wear, as a clothing piece. 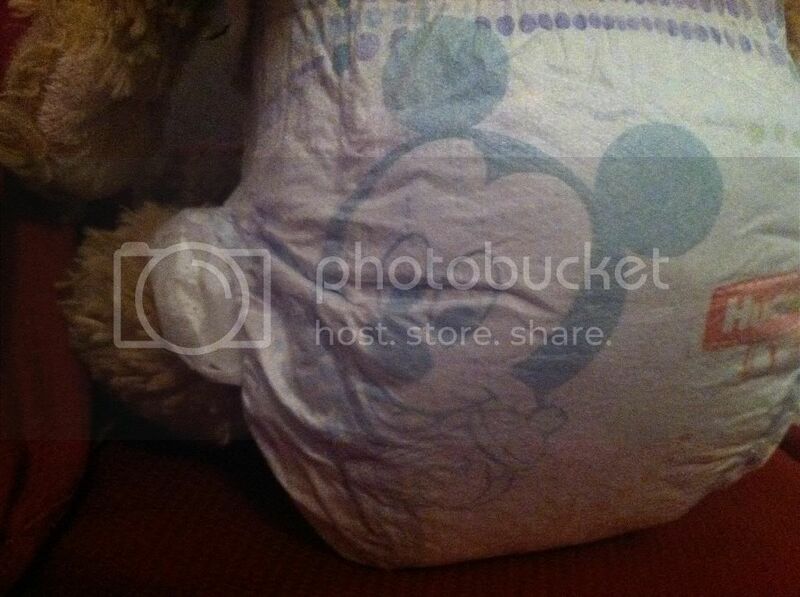 He loves the Mickey & Friends Prints on them. 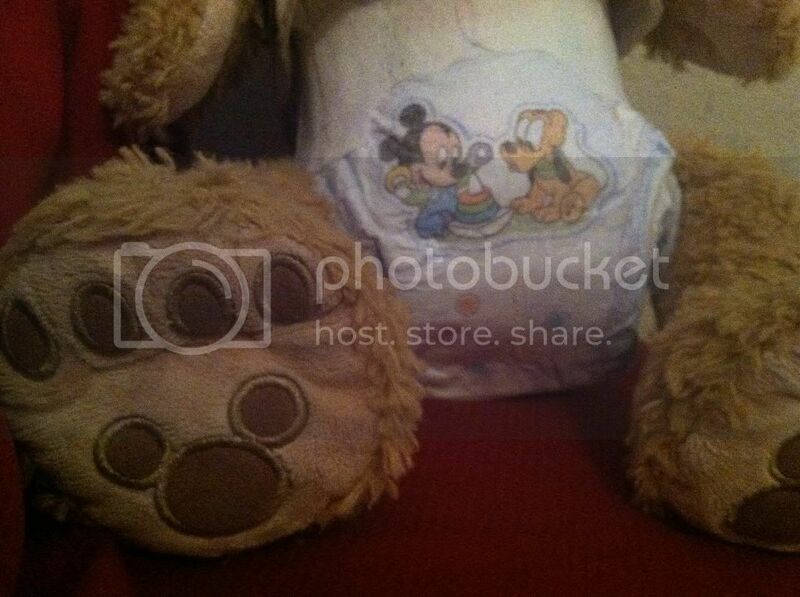 Since the diapers are smaller, they fit well on a regular 17 inch Duffy plush. 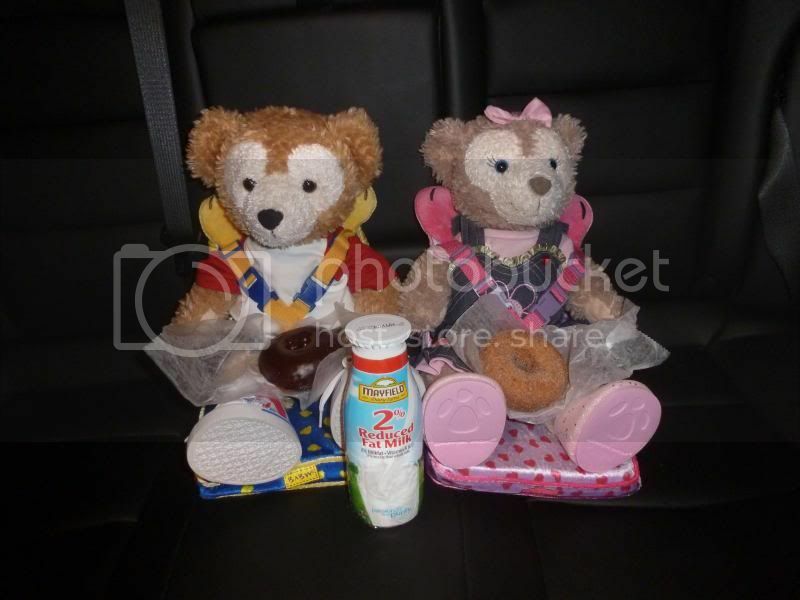 Duffy and Shellie May had their first road trip this year. 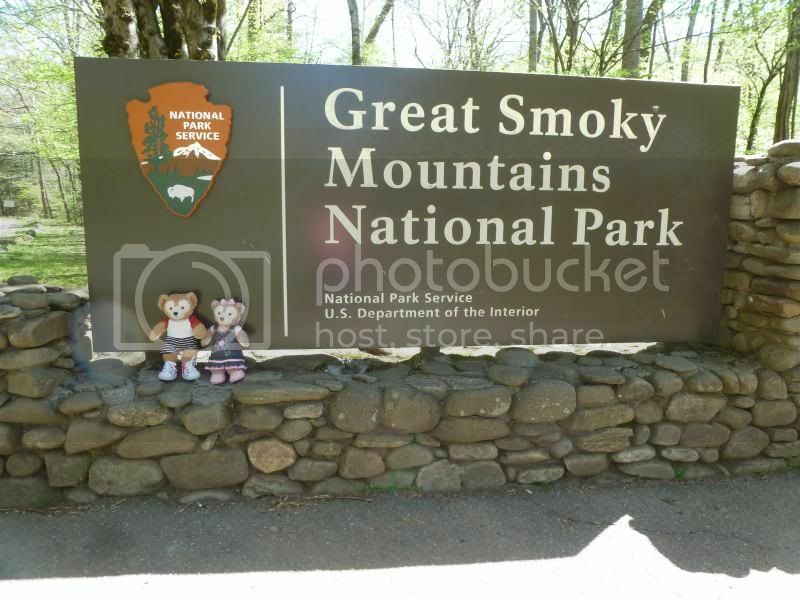 I took them to the Great Smoky Mountains National Park. 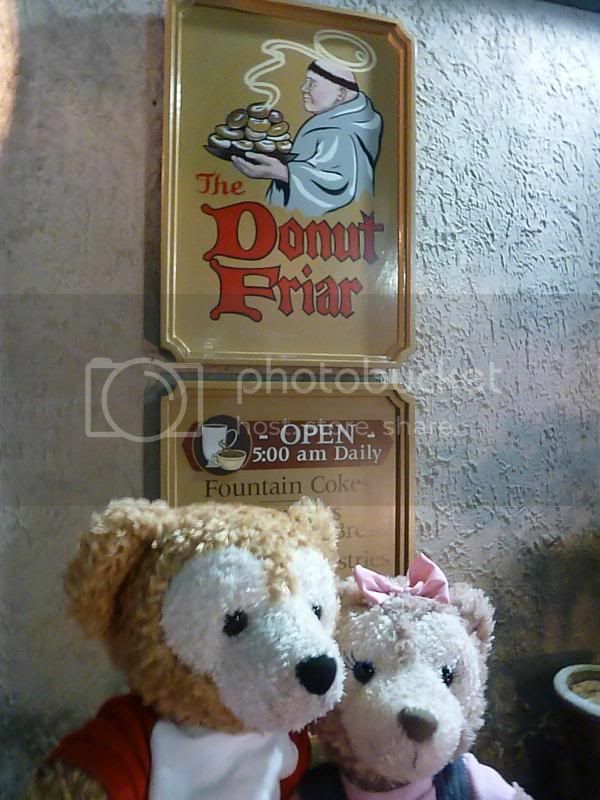 First we stopped at Donut Friar in Gatlinburg, TN which opens at 5 in the morning. They needed their energy for the day. 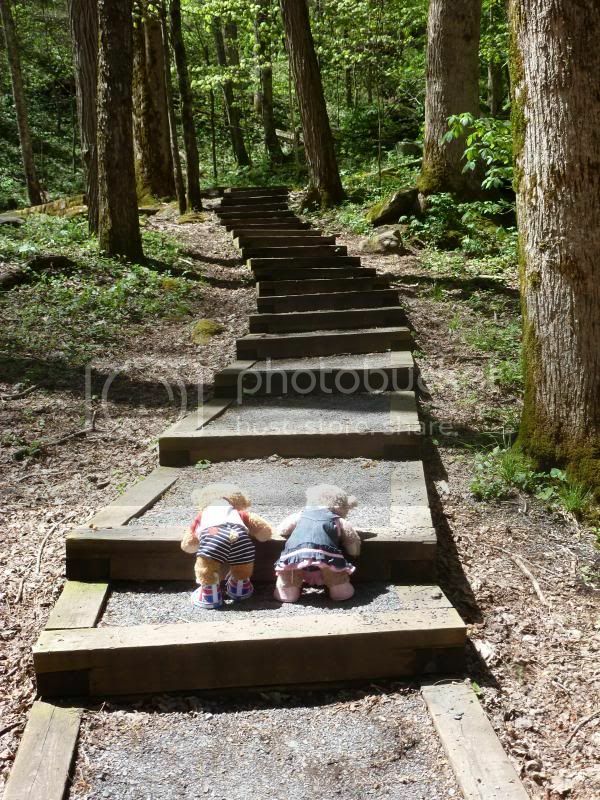 They were thrilled to enter their first national park. 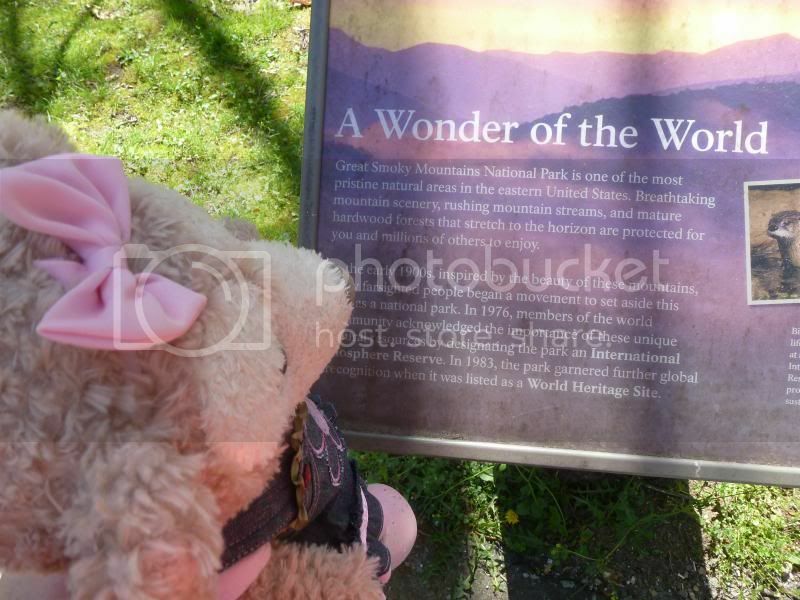 The Great Smoky Mountain National Park is the most visited national park in the country, because it's within a day's drive of so much of the U.S. population. 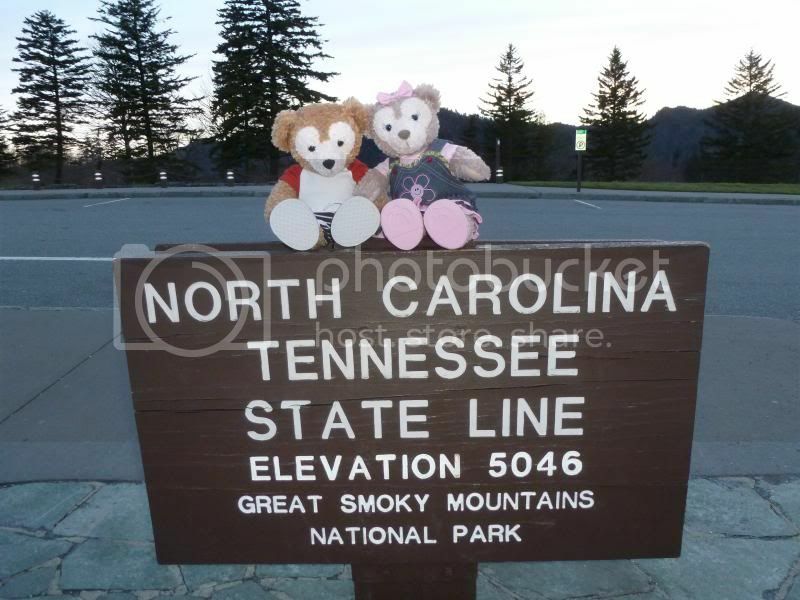 At Newfound Gap, they got their picture taken at the Tennessee/North Carolina state sign. 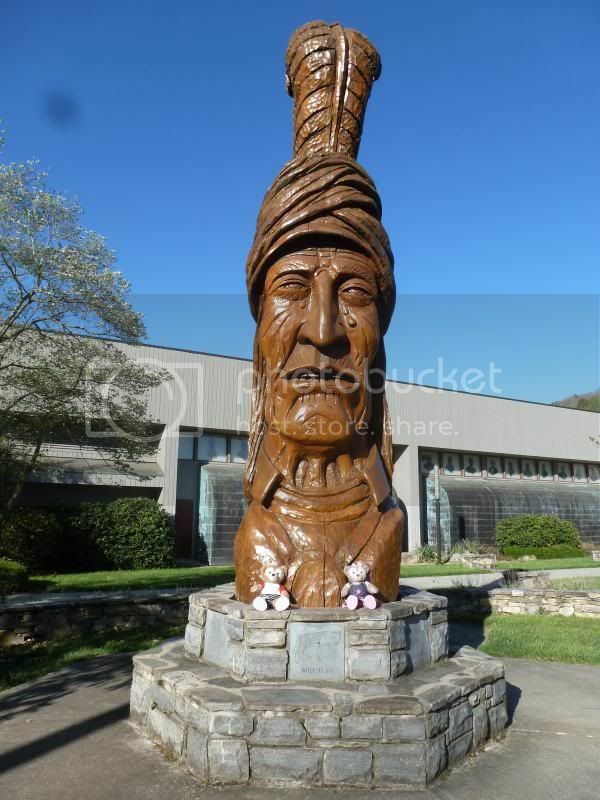 “North Carolina is a new state for us,” said Shellie May excitedly. 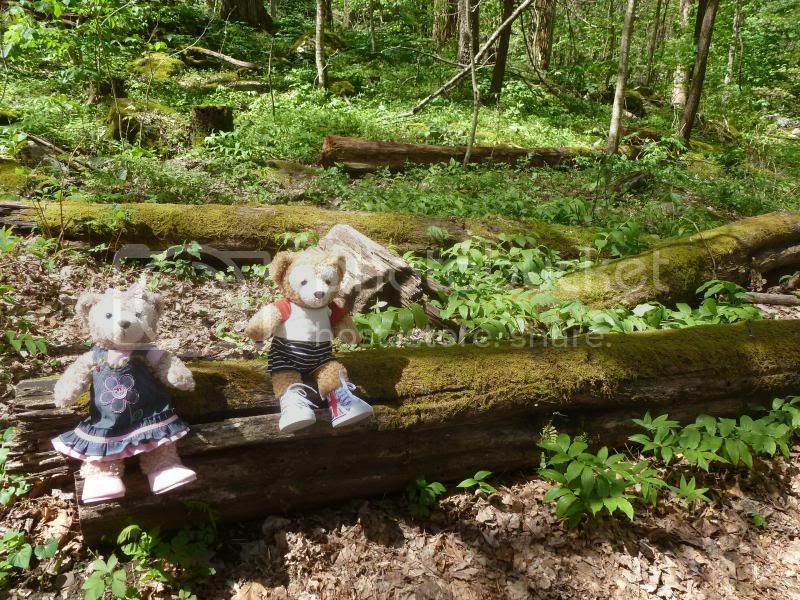 Back in Tennessee, we hiked the Cove Hardwood trail at the Chimneys Picnic area. 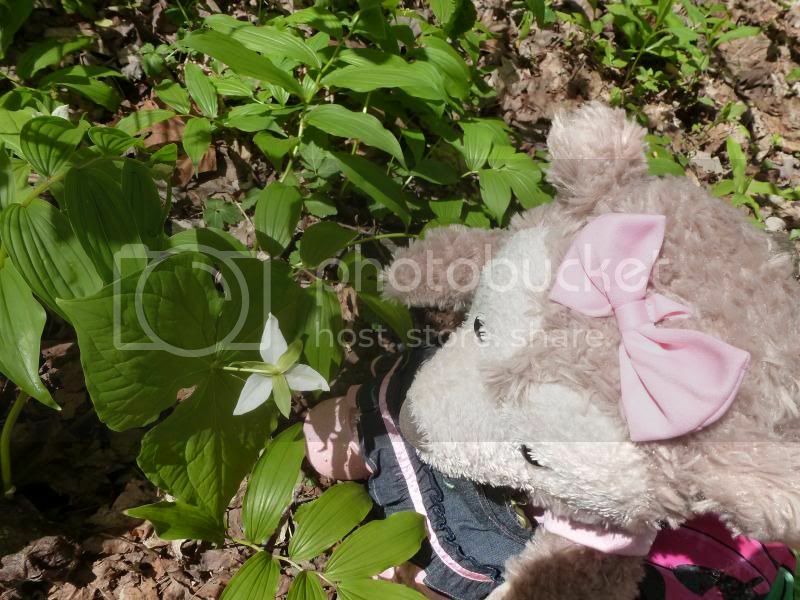 Shellie May spotted a trillium. “I remember this flower from last year when I wore my brownie uniform at Mousetail Landing State Park,” said Shellie May. She has a good memory! 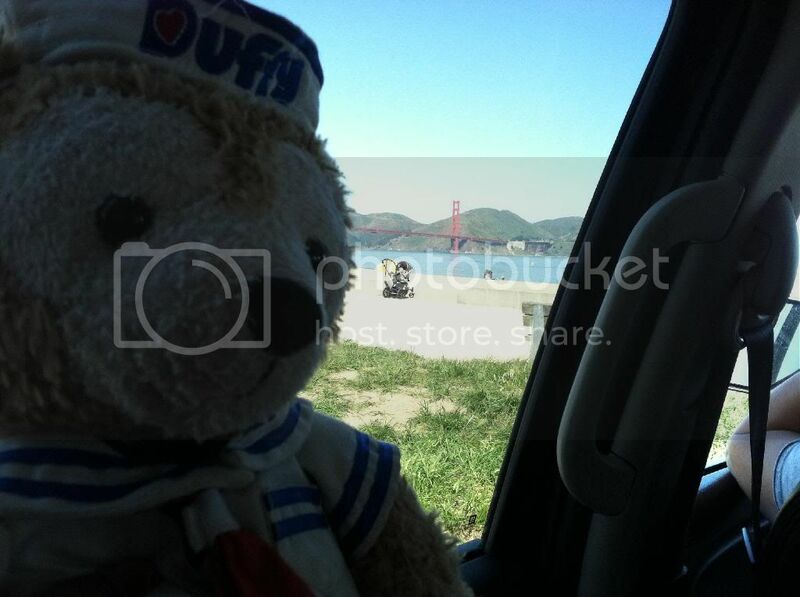 Duffy = How long is this trail? 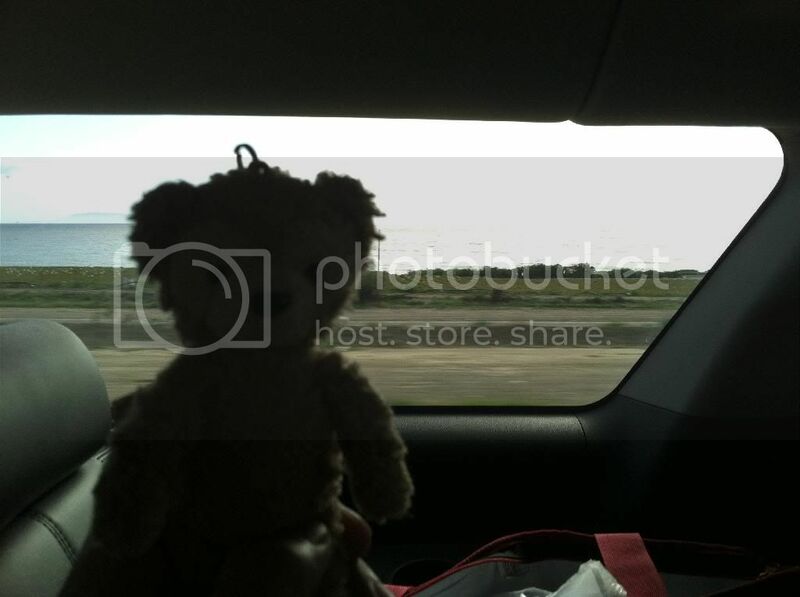 Shellie May = Yeah, are we there yet? 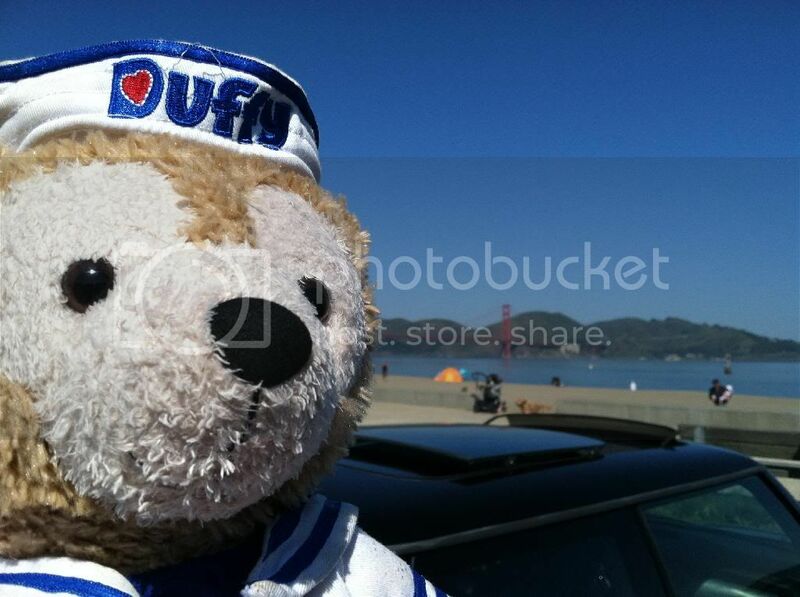 Duffy = what is there to see? Shellie May = I’m tired. Will you carry us? 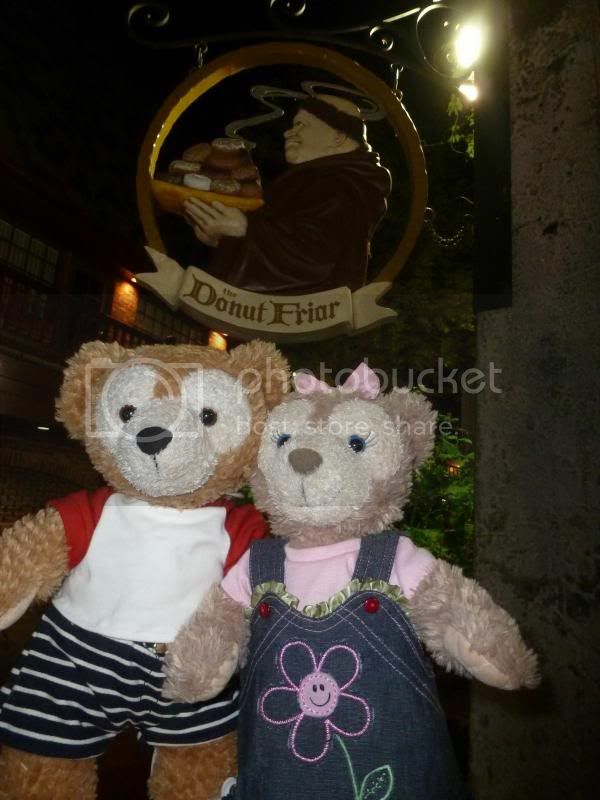 Duffy = I need another donut. Shellie May = forget the donut. I wish I had stayed in the car listening to my pawpod. 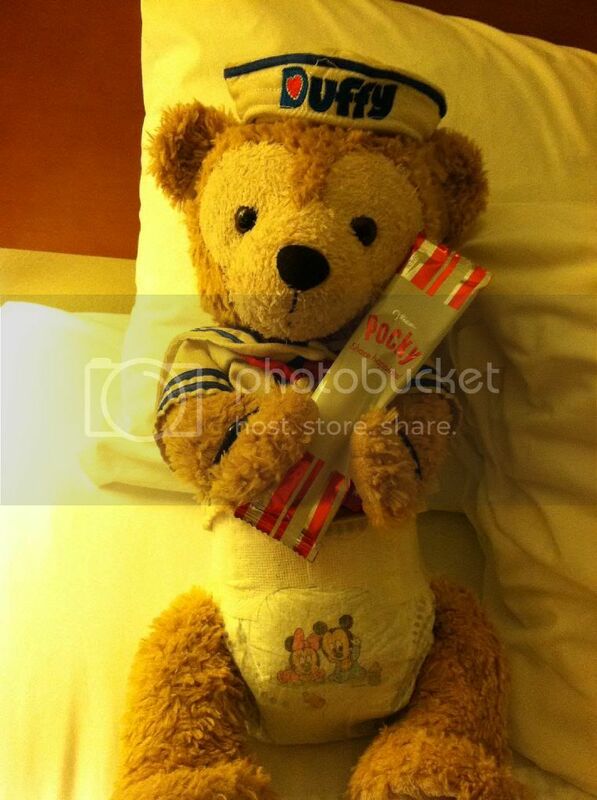 Duffy = sigh, how much longer? When they got to the stairs they started up but I decided with as slow as they are, it would be a win/win to carry them. They let out a big sigh of relief. Here they are taking a much deserved rest on a log. 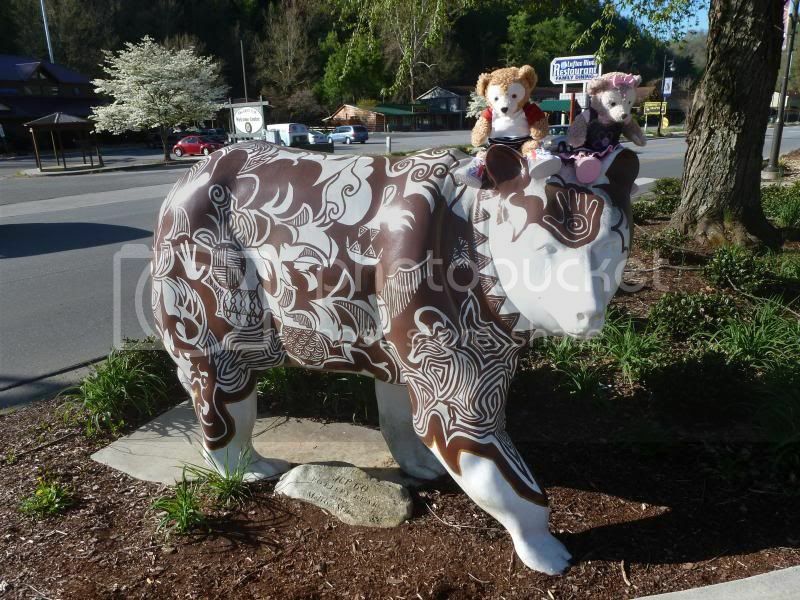 We looked at the Bear Art in Cherokee, North Carolina. 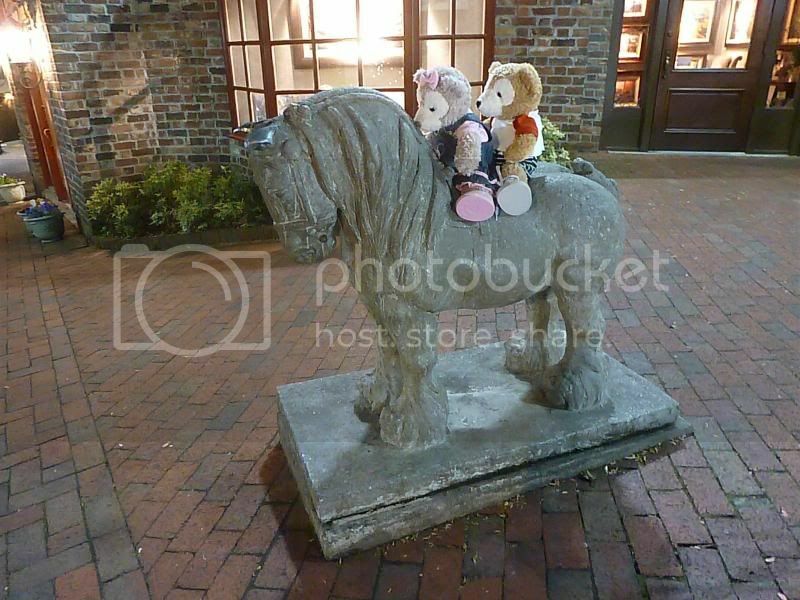 They wanted to climb on each one. 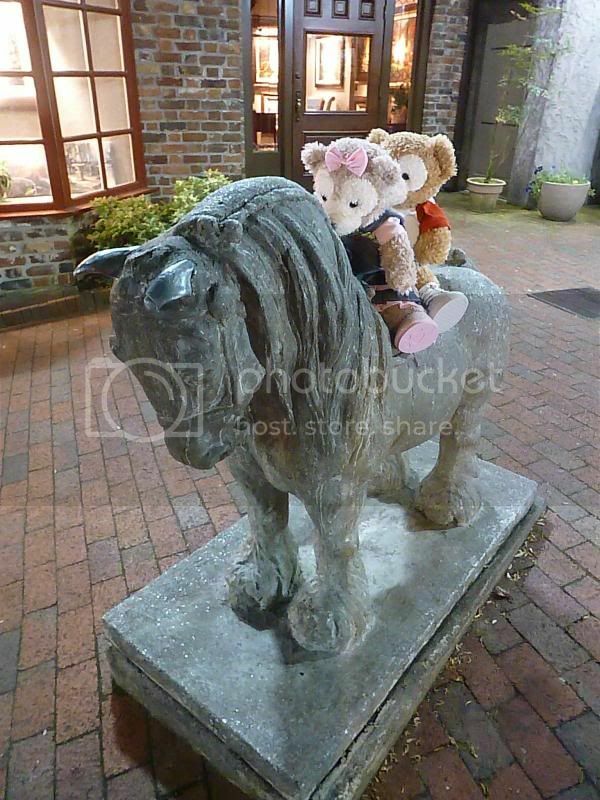 I think they were like little kids using stall tactics to avoid bedtime, only with me they were stalling hoping we’d have less time for walking! "Pee-YOU!" 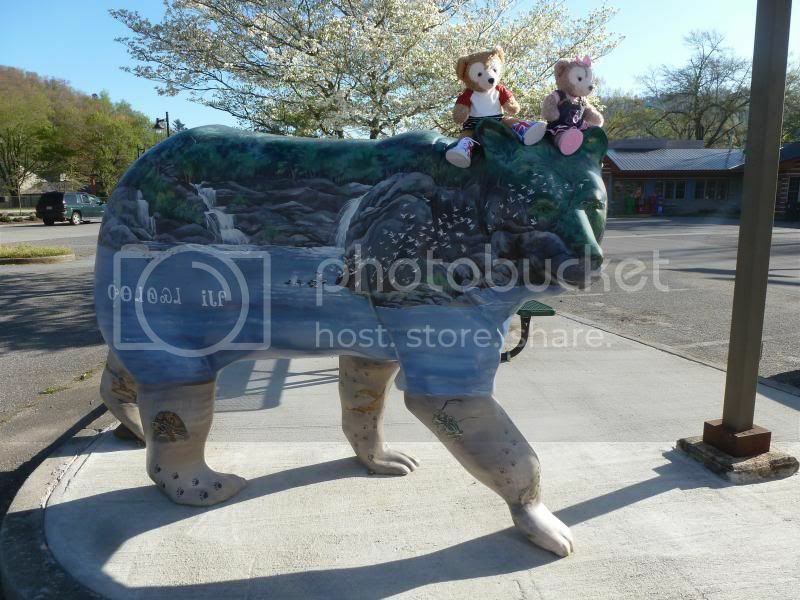 Shellie May exclaimed disapprovingly at this bear smoking its pipe. 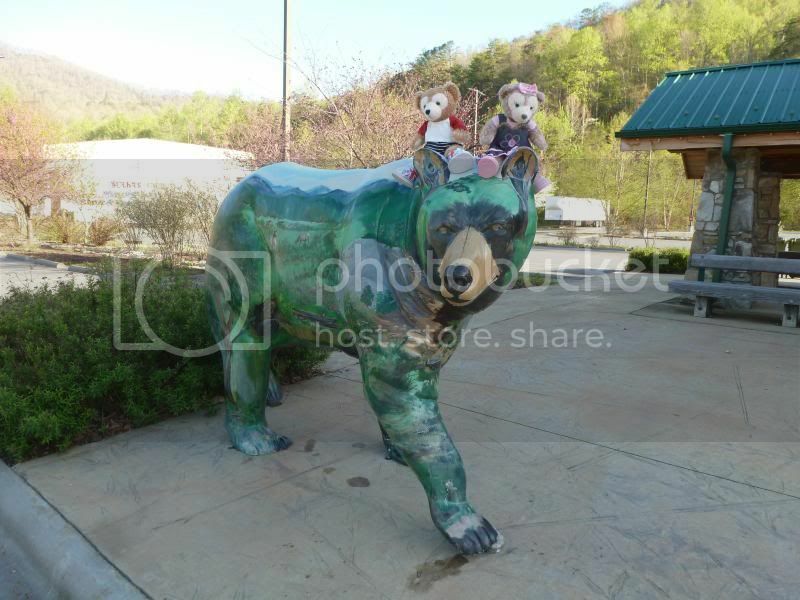 They like the sunrise/sunset, and scenic overlooks, because they can just get out of the car and see it right there. 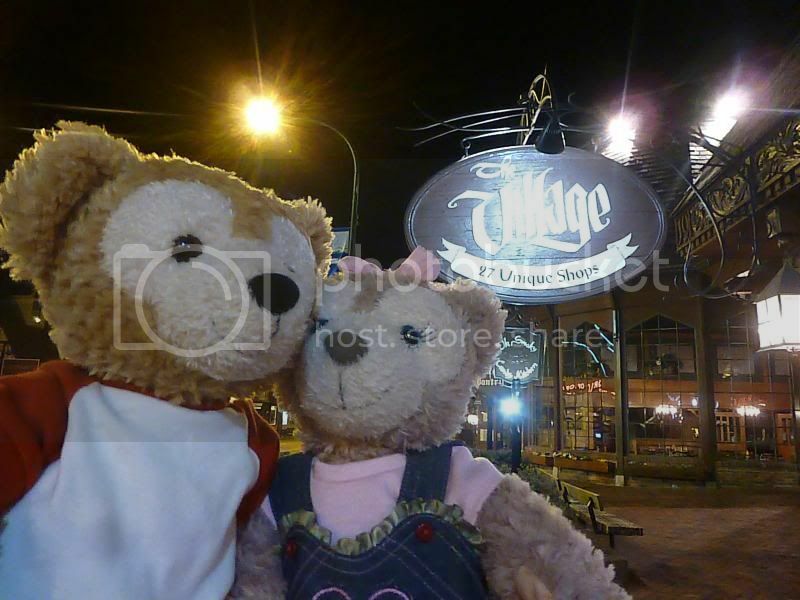 At night Shellie May wanted me to take a picture of her and a bear taking a picture of ME! 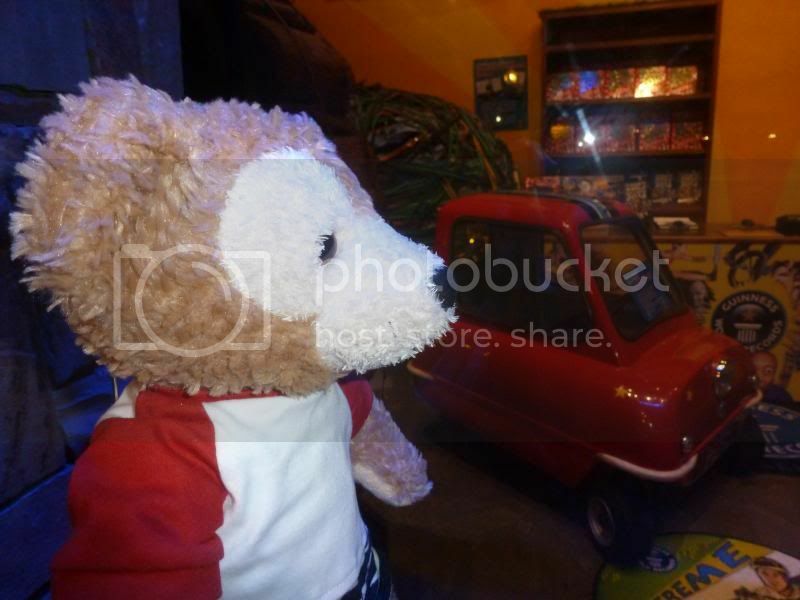 Duffy liked the little bitty car at the Guinness Book of World Records. 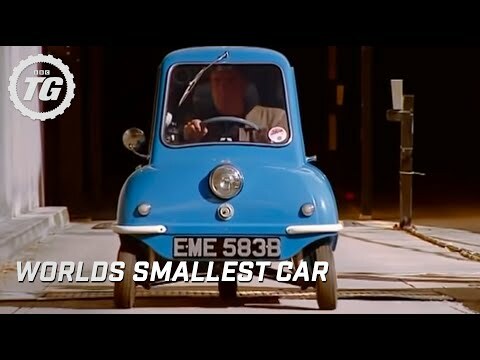 It is the smallest car ever in production. 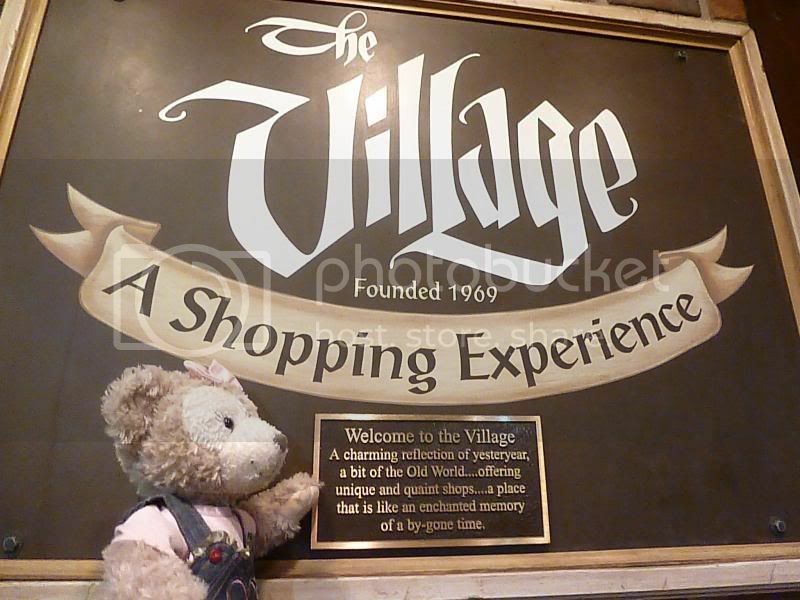 Shellie May pointed out the shopping at the Villages. That was about all the night life they got because they were tired and ready for bed quite early. 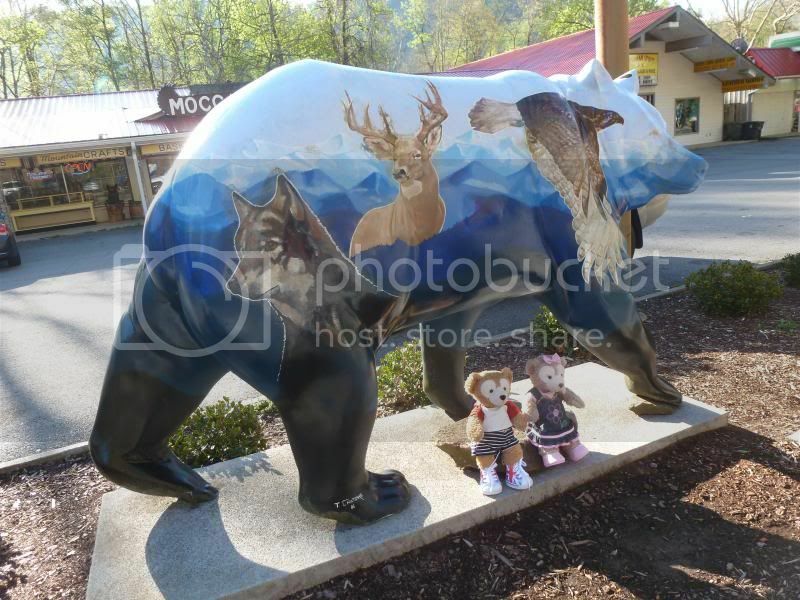 A good time was had by all and da bears have a new state to add to their repertoire. 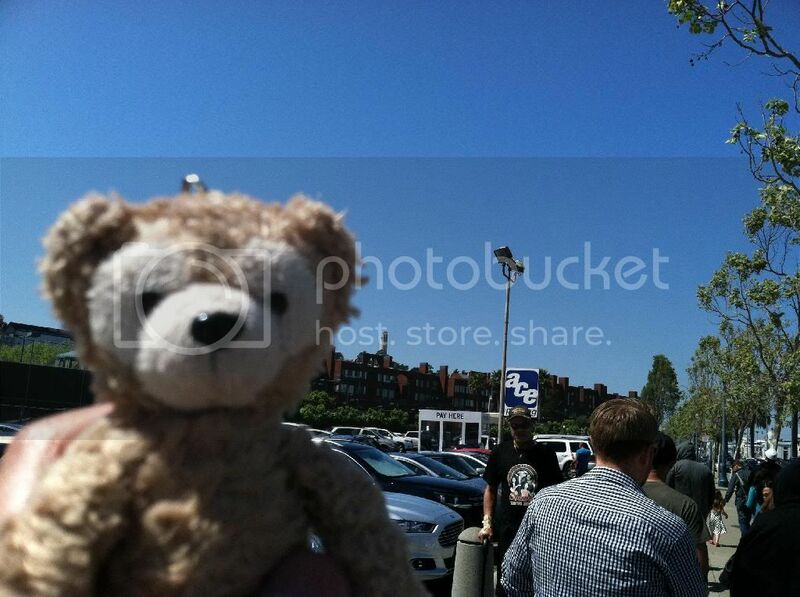 I love that tiny bear! 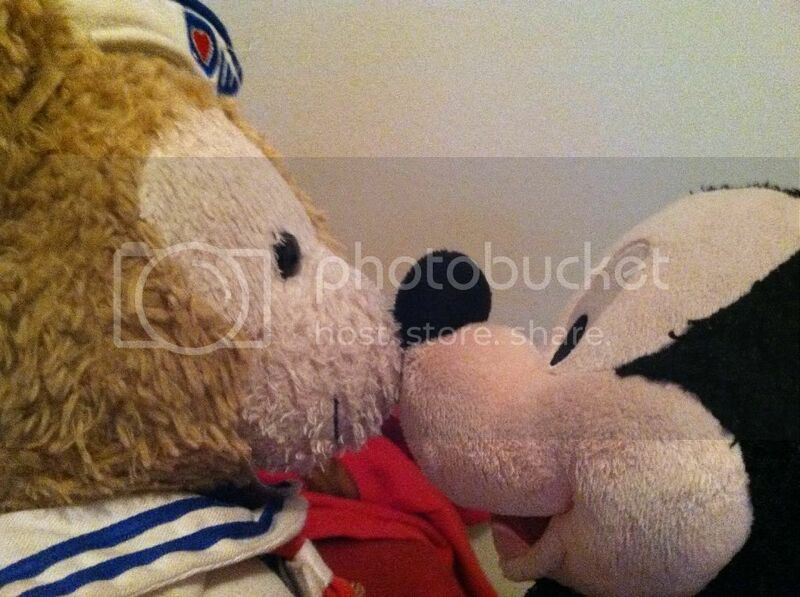 What a fun adventure your Duffy and Shellie May are having, JillT! Love it! 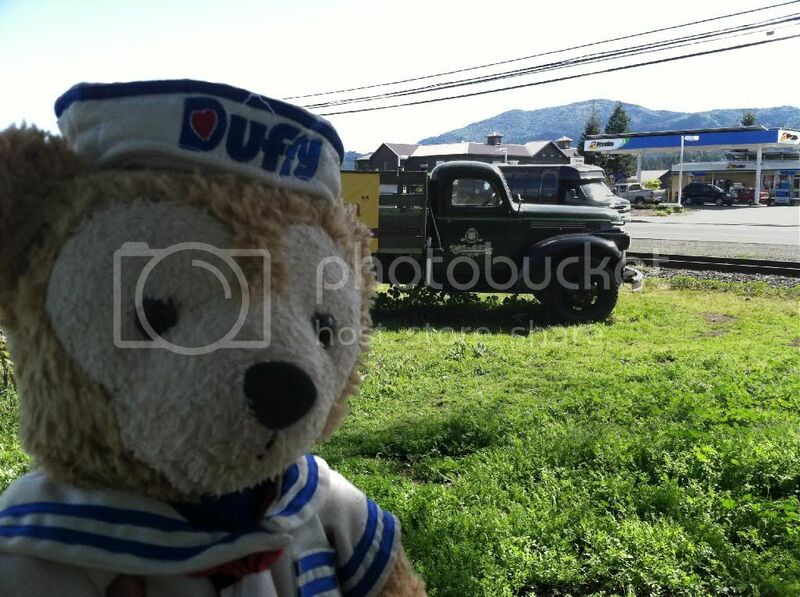 Daily Duffy Archive! 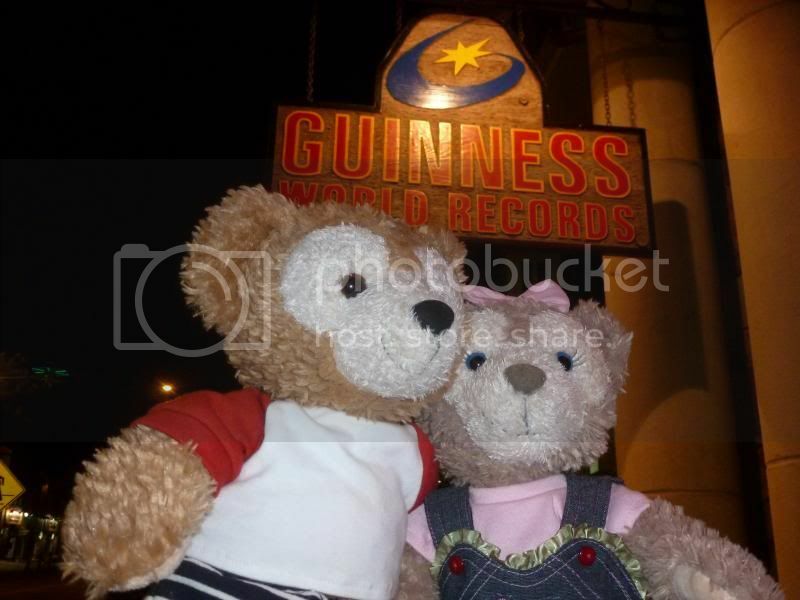 Adventures with Duffy, ShellieMay, or Gelatoni, updated regularly!